People spend several hours in their cars on a regular basis, some even daily. It might be going out for a dream road trip with friends or family, or maybe you’re a long distance driver. Whichever the case, it’s very important to ensure your trip is highly comfortable. However, there’re several factors that may prevent you from getting a perfect trip. The main culprit in this case is noise. As your car moves, the roaring engine and wind creates a lot of noise. Also, there may be vibrations as the car moves along rough roads. Thus, most car owners are always wondering how they can deaden such noise. The solution is fitting your car with an effective sound deadening material. There’re tons of sound deadeners available out there. Thus, it’s not that easy to know the best. Luckily, we have prepared a buying guide and review on the best automotive sound deadening material. Thus, worry no more! Just read on through this buying guide and review. There’re many manufacturers of sound deadeners in the market today. Choosing the best amongst all the different brands available can be confusing right? Thus, how can you know which brand to buy and which to leave? Well, it takes a lot to choose. Most people don’t have the time to keep on searching while others just go for the cheapest or most expensive choice. Rather than taking the risk of buying a product you don’t know, we have taken time to review the best automotive sound deadeners you can ever find. We gathered views of current users and what experts view about sound deadeners. We also took time to review existing research done on sound deadeners, including the must have features. From the information we gathered, we were able to come up with a list of 10 sound deadeners for automotive. 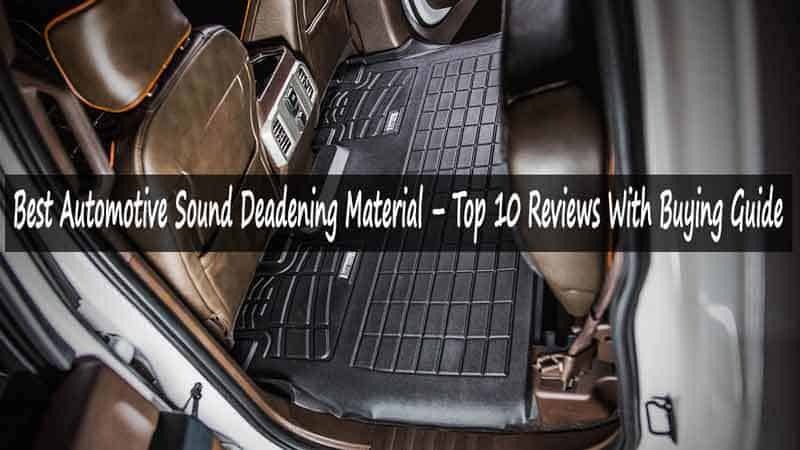 Therefore, with this review and buying guide, you’ll be assured of choosing amongst the best sound deadening products. Noico sound deadeners can be used just anywhere you would want to block noise. However, Noico 80 mil mat is best for deadening sound in automotive. It’s specially designed to eliminate general noise, the rattling of a moving car, and vibrations. Thus, it offers unmatched sound proofing capabilities in any automotive. Great thickness- The material making this sound deadener is 80 mil thick. The thickness makes it highly efficient in insulating sound of any kind. Lightweight- You would probably assume that this material is bulky due to its thickness. However, this is not true since Noico sound deader mat is very light, weighing approximately 0.7lbs for every sqft. Easy to install with an installation indicator- Most car owners worry about installation, but Noico comes as a very easy to install insulator. It comes with an installation indicator to notify you whether you’ve installed it properly. It contains butyl- These mats boast of containing butyl as one of the materials used in its manufacture. Butyl enhances its efficiency in insulating against sound while still being lightweight. Available in multiple sheets- Noico mats come in multiple sheets that can cover an area of up to 36 square ft. In total, you’ll get 9 sheets and this makes the set ideal for installing in multiple areas around your car. Our Verdict: Noico mats are ideal for soundproofing any part of your car including doors, roof, trunk and other parts. Moreover, it’s affordable. However, its rubber smell may not be friendly to some people, but it be blocked with the foil. Kilmat has manufactured a sound deadener that’s quite affordable while still performing better than some more expensive alternatives. It’s universal and may be fitted in any car. Besides insulating your car against noise, it also boasts of retaining heat in a car, thereby making your winter drive more bearable. Universal material- Kilmat sound deadener is designed for use outdoors and indoors. You can use it within your car to deaden sound coming from outside or even use it externally on the wheel well and hood. No odor- Some deadening materials emit unfriendly odor that many people cannot live with. Luckily, the Kilmat sound deadener is manufactured with odorless material and the adhesive used to apply it in place doesn’t smell either. Strong and long lasting adhesive- The mat comes with an adhesive to make installation easier. The adhesive is extremely strong and long lasting such that it sticks the mat in place firmly. Retaining heat- Besides insulating against heat, the Kilmat deadener also retains heat within the car. Thus, it makes it more comfortable to drive during winters since it keeps your car warm. Manageable sheets- This deadener comes in small, multiple sheets, totaling 34 in number. Small sized sheets are easier and more manageable to work with during installation and their multiple number makes it possible to cover more space. Our Verdict: This deadener is easy to work with due to the small nature of the sheets. However, the sheets are relatively stiff, thus it takes a bit more time to install. Nevertheless, they’re ideal for insulating any automotive surface, thanks to the butyl component and strong adhesive. Dynamat boasts of not just insulating against noise but also improving the overall quality of audio in any car. Applying Dynamat on the resonant surfaces of your car will allow you to enjoy enhanced sound clarity. It’s unique in that it resists heat, such that your car remains cool during hot summers. Aluminum coated- Dynamat mats are coated with a layer of aluminum. The aluminum coating enhances their heat resistance such that they don’t absorb heat. Permanent adhesive- The mat comes with a strong, permanent adhesive for firm installation. Upon installing Dynamat, it doesn’t come off easily such that it remains in place even when the car temperature is high. Flexible material- This sound deadener is made of a flexible sound insulator. The material is easy to work with such that you can install it on curved car surfaces with ease. Highly compatible- The mats come in a material which is compatible for application in different surfaces. Thus, you can install it on any surface or texture without any difficulties and it will hold firmly. Multiple applications- Besides keeping off all kinds of noises, the Dynamat material is also able to reduce the rattling of car subwoofers. It also allows for more bass to be retained within the car and this enhances the overall bass effect in the car. Our Verdict: Overall, Dynamat is very impressive and suitable for any car surface or texture. You can surely consider it in your shortlist. However, be ready to pay more for its brand name and quality, but it will surely deliver. Just like what the name Thermo-Tec implies, this mat is specially designed to insulate your car against heat and noise. Thus, it will make your car more comfortable when it’s quite hot while still keeping away the noise that interferes with sound. What more would you really want if not comfort and music enjoyment in your car? Polyethylene surface- Thermo-Tec 14620 boasts of having a polyethylene surface covering the deadener material. This surface is able to keep away radiant heat, thereby insulating against heat. Great for floors and doors- If your doors and the floor are the major entry points of noise, then Thermo-Tec has got what it takes to absorb the noise. It’s specially designed for application on automotive floors and doors. Easy to trim- The material can be trimmed easily to install around shapes on any car surface. This makes it easier to fit regardless of the shape you need to cover for insulation against noise. High temperature adhesive- Thermo-Tec sound deadener comes with an adhesive rated as high temperature. The adhesive does not melt easily such that it holds the deadener material in place regardless of high temperatures. User-friendly application- It’s very easy to install the deadener, even for a first timer. All you’ll need to do is cutting the material to fit the preferred area, peeling the back cover and sticking it on the preferred surface. Our Verdict: Generally, Thermo-Tec is great at insulating sound especially on doors and floors. Also, the polyethylene foil assists in protection against heat, but may unglue under extreme heat. Nevertheless, its dual purpose is worth your consideration. Superdense is designed as an effective noiseabsorption material for automotive, home theatres and music studios. It comes in form of 5 panels measuring 12 by 12 inches each. The panels are super dense, just like the product name implies. This makes them very efficient for deadening noise in any automotive. Extremely tough- The panels are designed to be extremely tough yet compact. This makes them highly efficient in absorbing noise and their toughness makes them more durable. Great NRC rating- The material and design of these sound deadener panels has great NRC rating. These means that they’re rated as highly efficient for absorbing and reducing noise, reverb and fluttering echo. Versatile- What could be better than investing in a sound deadener that you can apply almost anywhere? This sound deadener can be fitted in any automotive, studio and home theatre. Fireproof- The materials used in the manufacture of this panels makes them fireproof. You’ll not have any worries about them catching fire when used around hot areas such as the hood or near the engine. Visually appealing- You wouldn’t want to apply a deadener material that makes your car interior less attractive. Luckily, these panels are visually appealing and will enhance the interior décor of your car. Our Verdict: Superdense is ideal for insulating more flat surfaces such as the doors, hood, roof and floor. However, it’s relatively hard to install around curved car surfaces due to its dense and tough complexion. Fatmat comes as one roll of sound deadener material measuring 33.5ft long and 18 inches wide. All you will need to do is cut out a piece that will fit the area you want. Thus, it’s unique in that you can cut out any shape you want with ease to install around curves on your car surface. Efficient heat resistance- Fatmat sound deadener comes with an aluminum coating. The coating resists heat such that you can use it on hotter areas such as the hood without worries about the material melting. Very pliable- What’s better than a sound deadener you can bend easily while installing? Fatmat is designed to be highly pliable for ease of installation. Easy to cut- It’s effortless to cut this sound deadening material. You can easily cut it into the size or shape you want and this is beneficial considering that some car surfaces are irregular. Great surface contact- The contact surface of the material is ideal for adhering well on any car surface. Thus, it sticks well in place and gives you guarantee of not coming off easily. Comes with a roller- A roller is necessary when installing most types of sound deadeners. Luckily, Fatmat comes with a roller that makes it easier to apply pressure on the material for the adhesive to stick properly. Our Verdict: Fatmat is very easy to install. It’s also quite lengthy and one roll may be enough to cover most of your car. Thus, check it out before it runs out of stock, but be ready to pay more for its quality. Withstands extreme temperatures- It can withstand as low as -30⁰F and as high as 400⁰F. Thus, you can use it efficiently during winter or summer, and even when your car is hot. Keeps your car warm- Besides keeping off external road noise, HushMat will also keep your car warm during winter. It will retain the heat generated by your car, giving you more warmth during winter. Wraps easily- Cars have tight areas and curved sections that don’t work well with solid deadeners. Luckily, HushMat is made of a material that wraps very easily and effortlessly around the tightest areas. Covers a large area- HushMat comes in 20 sheets, each measuring 12 by 23 inches. Thus, the sheets can cover most of your car, especially the main areas where noise enters such as doors, floor and roof. Sticks well on oily or greasy surfaces- Some car surfaces are always oily no matter how clean you keep your car, especially in the hood and around the engine. HushMat sticks well on such surfaces, thus don’t worry about oily surfaces. Our Verdict: HushMat is extremely user-friendly to install. You won’t require special adhesives to install since it comes with its own adhesive. If you’re willing to pay more for efficiency, then consider HushMat. Uxcell is one of the best automotive sound deadening material. It’s unique in that it’s made of a very thin layer of foam. The foam padding, also known as Uxcell liner, works by keeping automotive noise away from the interior. The foam is a form of a fiber cloth, with a scratch resistant coating. High performance material- The foam making this deadener is very thick. Thus, it offers high efficiency in insulating against sound and heat, and absorbing noise. Scratch resistant surface- Cars experience lots of movement and tools touch the body of the car when doing repairs or maintenance. Luckily, uxcell is scratch resistant and you’ll never worry about it being damaged when moving items in your car or when your car is undergoing repair or maintenance. Heat proof material- Uxcell is made of fiberglass foam and has an aluminum coating on top. The aluminum foil blocks sunlight and heat from the car engine and exhaust. Hence, it reduces excessive reliance on AC, thereby saving on gas. Reduces aging of paint- Car paint ages quickly due to heat from the car. The foam insulates the car from excessive heat, especially from the engine, thereby enhancing the lifespan of paint. Multi-functional- It’s worth noting that this foam can be used to insulate more than just your car. Thus, if you bought it for your automotive and some piece remains, you can as well use it to soundproof your home theatre room. Our Verdict: Generally, uxcell is one of the most affordable noise deadening materials you can find. If you’re working on a tight budget, you can consider this deadener. It’ll deliver despite being extremely affordable. Noise and heat are huge concerns in any car. What would be greater than an insulator that can keep the two away? Car Insulation stands out when it comes to insulating against heat and noise. This way, it allows for a more comfortable car environment and a better listening experience. Great heat and noise barrier- Car Insulation comes with an efficient thermal barrier that makes it block radiant heat efficiently. It also reduces road noise that gets into the car. Easy to work with- Its lightweight nature makes it easy to install in any car surface. You’ll not struggle with the mat while sticking it on any car surface. Scores highly on flexibility- When it comes to flexibility, Car Insulation outshines most of its competitors. The mat is easy to apply around irregular surfaces due to its great flexibility. Fits on any car surface- Regardless of the type of automotive you drive, this mat will fit on just any car interior. Its material and surface are ideal for use on any car interior such that if you own different types of cars, you won’t have to buy different types of mats. Crush resistant- This deadener stands out for resisting most types of crushes. In case you crush an item on it when packing your car with some goods, it will not get damaged. Our Verdict: While Car Insulation works efficiently in insulating your car against heat and sound, it doesn’t come with its own adhesive. Thus, you’ll need to buy an appropriate adhesive. Nevertheless, Car Insulation is a great option. GTMAT noise deadener is packaged in two sets of rolls, each measuring 25 sqft lengthwise. Thus, you get a total of 50 sqft mat. It stands out in that it has a rubber compound in the material that adds to the mass of car parts, thus reducing their rattling. Sticks almost instantly- The mat comes with a high performance adhesive that sticks almost instantly. This means that you will not experience a lot of waiting time for the mat to stick. Reliable and efficient roller- GTMAT comes with a roller that’s very easy to use. It makes it easier to apply pressure on the mat while sticking it. High application temperature- The mat can be installed at a room temperature of 10-50 degrees Celsius. Warmer temperature allows for better adhesion. Instruction manual- This sound deadener comes with a user-friendly instruction manual. You’ll not struggle to install the mat as the step by step instructions will guide you through. Not selective to car surfaces- A great thing about GTMAT is that it’s not selective on application surfaces. It sticks firmly on almost all types of car surfaces. Our Verdict: Overall, GTMAT is user friendly to install. Its instruction manual is simple to follow and the mat sticks quickly. Nevertheless, you’ll still need to apply constant pressure to get a tight bond. Sound deadeners come in different sizes, brands and materials. Different brands have their own unique features. It can be quite tricky to decide on the deadener material to buy However, if you’re well informed about what to lookout for, then you’ll most likely make an informed choice. With that said, here are the things you should consider when buying a sound deadener. Before you make a choice, you should know the method of noise isolation that the material uses. First, you should know that soundproofing is not the same as sound absorption. A soundproof material minimizes outside noises from entering into the car. Such noises include traffic noise, wind, humming of the tires and road vibrations. Thus, if most of the noise is coming from outside, a soundproofing material will work better. Materials that absorb noise usually absorb noise from within the car such as rattling of the trunk, loud motor, and cabin noise. If most of the noise in your car is coming from the inside, then you should go for a material that absorbs noise. Nevertheless, you can also combine the materials. For instance, you can use sound absorbing materials on the cabin and trunk and use soundproofing material on the doors, roof and floor. Damping Mats- These mats are most common and are ideal for application on panels. Insulators- They’re usually made of fiber cloths. They’re ideal for absorbing noise from beneath the car carpets. Foam- Foam is most efficient for deadening reverberations in the cabin. Foams are generally available in form of sheets. Sprays- Sprays are suitable for application in areas where mats cannot be used. They’re the least common noise deadeners. It’s obvious that thickness matters a lot with regard to insulation against noise. Thicker materials are better at deadening sound than thinner ones. You can even use multilayered material for enhanced sound deadening. Different sound deadeners come in different sizes. The size you should buy should depend on the extent of the area you want to insulate. Some of them come as rolled mats such that you can cut out the size you want. Others come as pre-cut sheets. The size of the sheet to buy should also depend on the area to cover. Cars bodies are always in contact with oil. Even if you’re very careful with oil and grease, and you keep your automotive clean at all times, you will not escape from having some oily car surfaces. Thus, you will want a sound deadener material that can stick to any surface, even if the surface is oily. Hence, investing in a sound isolation material that sticks on oily surfaces will be a plus. Different deadeners weigh different. Preferably, go for a lightweight material for easier installation. Lightweight materials are easy to fix since you’ll not use much energy and effort to fit on any surface. A highly flexible material will allow for easier installation. You’ll easily bend it around irregular car surfaces, something which is very common about cars. In conclusion, it’s clear that there’re many types of sound deadeners to choose from. Avoid choosing a material based on price alone. Choosing a material just because it’s cheap may lead you into choosing a low quality sound deadener. Again, an expensive material doesn’t necessarily mean that it’s the best. Thus, balance between price and quality. Hence, consider other factors such as size of the material, thickness, flexibility, and method of noise isolation among other factors mentioned previously. By keeping this guide in mind, you’ll automatically stand a better chance of getting the best automotive sound deadening material. Also, don’t forget that each material comes with its own unique benefits and some shortcomings. Thus, invest in the material that offers the kind of features you want and the shortcomings you can live with for the best sound isolation in your car. That way, you’ll enjoy enhanced music in your car while being in a more comfortable car environment.